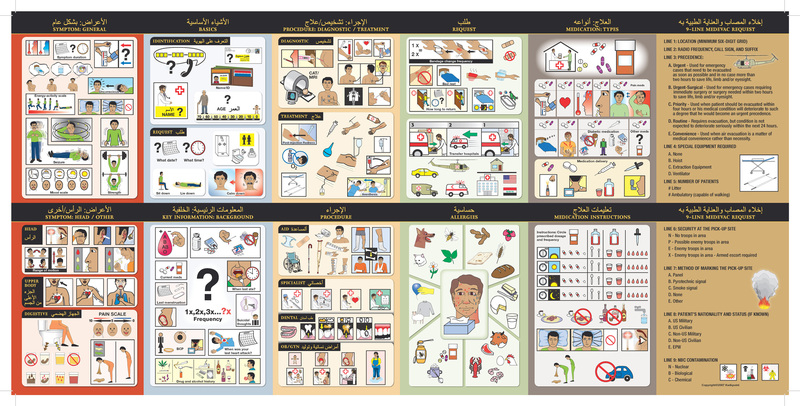 The Iraq Medical Visual Language Translator facilitates communication between medical personnel and Arabic-speaking patients and contains essential content for dealing with and treating medical needs and emergencies. Helps exchange information with patients about symptoms and conditions including falls, bites, wounds, allergic reactions, toxic ingestions, critical pain and illness identification, and medication and treatment options. Also includes basic veterinary diagnosis assistance, 9-Line Medevac Request procedures and prescription instructions for 20 drugs translated into Iraqi Arabic. What is a Kwikpoint User Guide? What is a Kwikpoint Reference Guide?